Young children living in poverty experience unique barriers to food access, stable housing, healthcare, and social support. In addition, they are at an increased risk of depression, intimate partner violence, and poor health behaviors as they grow older. As a result, children who grow up in poverty experience higher rates of illness and death than children who do not. Louisville currently ranks 7th among its peer cities with 22.4 percent of children under the age of 18 living in poverty. The poverty line in 2015 was $15,930 for a family of two and $20,090 for a family of three. 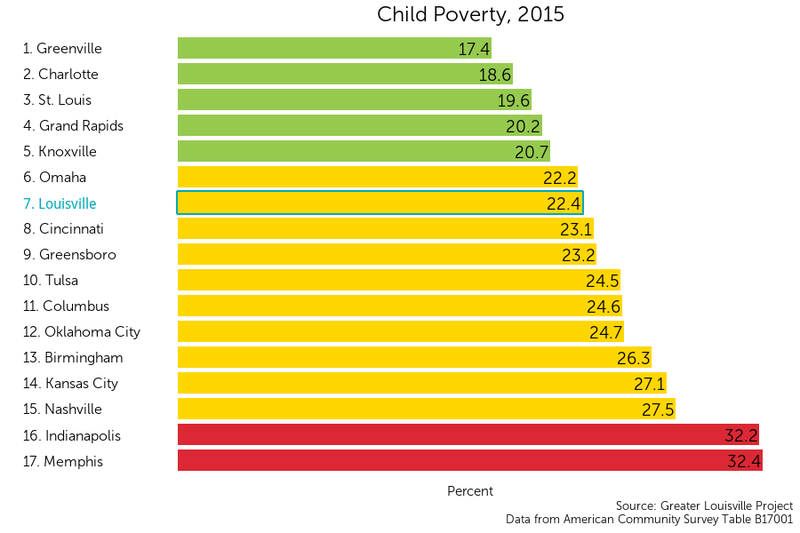 Although Louisville ranks 7th out of 17 cities in child poverty rates, child poverty varies substantially within the city, ranging from 67% in some neighborhoods to 4% in others. In the map to the left, areas with higher rates of child poverty are purple, and areas with lower rates are white. Child poverty is most concentrated in Louisville’s western and downtown neighborhoods. Russell, California, Smoketown, and Park Hill are several neighborhoods with particularly high rates of child poverty. The lowest rates of child poverty are in Floyd’s Fork, the Highlands, and Northeast Jefferson. The child poverty rate in Louisville has been steadily decreasing since 2011. Until then, Louisville traditionally ranked in the bottom 50% of its peer cities. 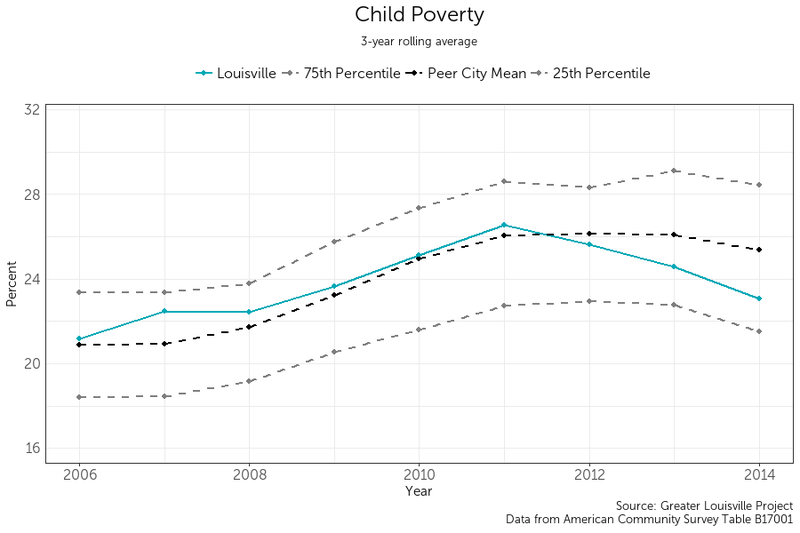 However, Louisville has been reducing child poverty at a faster rate than many of its peer cities over the past 5 years, and it is now ranked just outside the top 25% of its peer cities. Concerted efforts to eradicate child poverty could create a foundation that would place Louisville in the top tier of cities for generations to come.